In order to verify the performance of this furnace, the present study focused on LNT solid solutions. 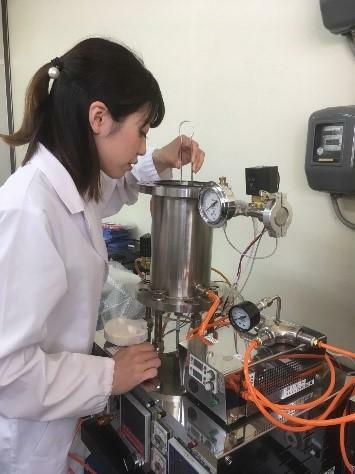 Professor Nakano and her team have worked on LNT solid solutions for many years, researching their electrical properties and application as a host material of phosphor, and had already obtained basic data on the material in electric furnaces and millimeter-wave heating systems. Professor Nakano explains that, "In a particular formation area, this material exhibits a unique periodic structure (superstructure) known as the M-phase in a self-organized formation. This superstructure has a trigonal LiNbO3-type structure as a matrix and is formed by periodically inserting a corundum [Ti2O3]2+ layer as an intergrowth layer so as to divide the matrix." With a conventional electric furnace, materials that have a uniform superstructure require a long sintering process to be synthesized. If these materials could be uniformly synthesized in a shorter period of time, they could be more widely used as practical materials. How exactly was rapid synthesizing achieved in the present study? It is generally known that an oxygen vacancy mechanism is dominant at low oxygen partial pressures and cation vacancy is dominant at high oxygen partial pressures. Using low gas pressure for this study led the team to discover that there exists an oxygen diffusion mechanism involving interstitial oxygen despite the dominance of cation vacancy. As shown in FIG. 2, Ti valence changes from Ti4+ to Ti3+ at the intergrowth layer to cause oxygen vacancy. Then, interstitial oxygens promote oxygen diffusion along the direction of intergrowth layer just like balls on a pool table. As a result, the grain shapes become anisotropic in the grain growth direction and plate-like grains are formed. At the start of development, I considered rapid sintering using a different device because I believed there was no way rapid sintering could be performed using an air-pressure control furnace at approximately 3x the ordinary pressure. But one day, an engineer at our research partner company Full-Tech Co. Ltd., carried out an experiment using this furnace. Even though no similar experiments had been successful in the past, that particular experiment on that particular day produced a very even material. From then on, I started to conduct experiments in this air-pressure control furnace under various conditions to finally confirm a reduction in the sintering process. However, at the time, there were very few reports on successful material synthesis in such pressurized areas, and I spent three months sifting through publications to try and uncover the mechanism behind rapid sintering. It was then that I attended a conference at which one invited speaker talked about oxygen diffusion behavior at high temperatures, showing a video that explained their simulation results. The interstitial oxygen dispersed oxygen ions in a material when the material has oxygen vacancies much like balls on a pool table when struck. As soon as I saw that video, I put two and two together and realized that that was the mechanism behind rapid sintering. Currently, we are looking to apply this technology to other materials that take a long time to sinter in an air-pressure control atmosphere furnace. This material can also be used as a material for products in different fields such as optical communication devices, various sensors and LEDs. This work was partially supported by a Grant-in-Aid for Scientific Research (c) No. 16K06721 (Hiromi Nakano) by the Japan Society for the Promotion of Science.